"The teachers are still working — they're participating in this walkout and they're still supporting their kids." OKLAHOMA CITY — Massive teacher protests at the Oklahoma state Capitol have done more than put political pressure on lawmakers: The situation has forced school districts, churches, community organizations and parents to improvise to take care of students. 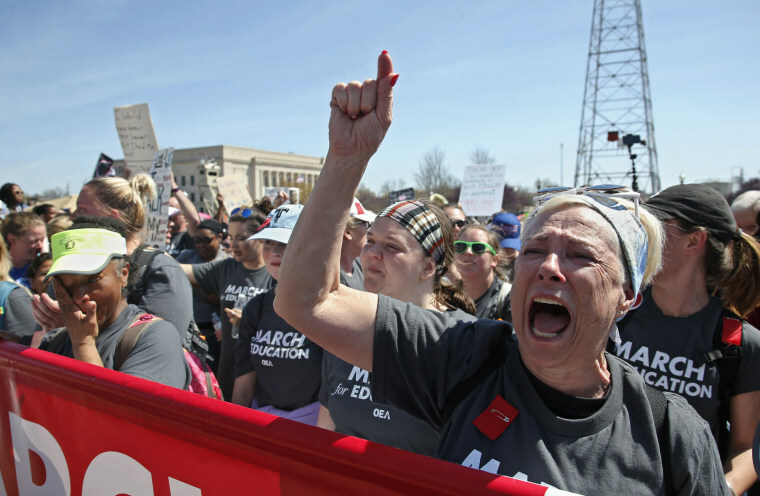 The state's largest two school districts will be closed for a ninth consecutive day Thursday, matching the length of a walkout in West Virginia earlier this year that started a rebellion of teachers in some Republican-led states including Kentucky and Arizona. Oklahoma Republican Gov. Mary Fallin approved teacher pay raises of about $6,100, but many educators say that's not enough because classrooms still need more money. Teachers' union leaders have not indicted when they expect demonstrations to end, but the number of protesters has dwindled, and Republican legislative leaders say they don't plan to consider more bills to raise more revenue. Still, groups have worked together to make sure kids have been entertained, educated and fed. Here are some ways they did it. Nutrition workers for the Oklahoma City school district made cafeterias mobile to deliver food to hungry kids. Employees packed ice chests that typically carried premade peanut butter and jelly or turkey and cheese sandwiches, apples and oranges, and milk or water. School buses then hauled the meals to places where kids were already gathering. The district has served nearly 17,000 sack lunches just this week at more than 30 sites including community centers, city parks and churches. They delivered enough Wednesday to feed the 80 elementary school-age children at South Lindsay Baptist Church, a temporary home for a Boys & Girls Club that normally meets at nearby Cesar Chavez Elementary School in a poor neighborhood on the city's south side. All Oklahoma City school district campuses have been closed to the public during the walkout. Group activities there ranged from ballet lessons and study sessions to hula-hooping to Taylor Swift and playing Uno. Teen and adult volunteers, including teachers from the district, have helped keep the kids active. Otis Moses, a supervisor in the school district's meal services division, said day-to-day operations may differ from typical school days, but he said his team has pulled together to serve kids and support teachers through the walkout. "Yes we're ready to get our students back in school and back in the buildings," Moses said. "But at the same point in time we're going to do what we can do from a nutrition standpoint to help our children out every day." Parents Nichole and Nathan Dill took their five kids — who range in age from 2 to 9 — for a stroll in Oklahoma City's Myriad Gardens on Wednesday with campuses for their school-age children in the suburb of Newcastle closed. In the eight days of canceled classes, the mother has worked on multiplication tables with one daughter, and reading skills for a son who would be preparing for standardized tests if he were in school. They've spent time at their local library, and they were planning to see the Oklahoma City National Memorial, which honors the 168 victims of the 1995 bombing of the Alfred P. Murrah Federal Building. The Dills are missing out on money they would be making at their business Turf Wars, an indoor Nerf gun arena. They've kept it closed this week because whether their school district will have class or not has been a day-by-day decision. But the Dills say it's worth it to stand up to legislators who have refused to properly fund schools. In Newcastle, parents have started buying items on teachers' Amazon wish lists to make sure they have classroom supplies and furniture. Nichole Dill said she also took her kids to see demonstrations at the Capitol to show them teachers aren't in school for good reason. "We fully support them being out right now," she said. Oklahoma City teachers may not be in the classroom, but they are still on the sports field. Peter Evans, executive director of the nonprofit Oklahoma City Police Athletic League, said dozens of teachers serve as coaches for soccer season, which is just now underway. The walkout hasn't stopped them from showing up for practices and coaching the more than 1,000 kids on 50 teams. The first matches are set for this weekend. Kids representing 31 elementary schools in the Oklahoma City Public Schools system compete for free. The league picks up the cost of the programs, which also include football, volleyball, basketball and cheerleading. Evans estimated that out of the roughly 100 soccer coaches signed up for this season, at least 70 are teachers. "The teachers are still working — they're participating in this walkout and they're still supporting their kids," Evans said Wednesday. "They're at the Capitol trying to fight for more money for the kids but showing up to schools in the afternoons for practice and showing up on weekends to play the games." The Tulsa-based Community Food Bank of Eastern Oklahoma has dispatched two food trucks to nine locations and served nearly 800 lunches a day since the teacher walkout began April 2. Wednesday's first stop offered pepperoni pizza, salad, a banana and strawberry milk at an apartment complex in east Tulsa. Helping prepare food inside the truck was Jimmy Burdette, a multimedia teacher at Broken Arrow High School just outside Tulsa. He said with tens of thousands of fellow teachers already rallying at the state Capitol, he thought he could do the most good back here, serving meals to out-of-school students. "A lot of them, the only meal they get that's hot is in school," Burdette said. Latairrius Williams watched as his school-age sister and brother got their lunches. The 24-year-old said the free meals have been crucial for families in the area who depend on school meals to feed their children. "I think this food truck idea is a really good idea because it's a lot of families out here that are low-income and they actually have a budget basically for the amount of food they eat a month," he said. Juozapavicius reported from Tulsa, Oklahoma. AP Sports Writer Cliff Brunt in Oklahoma City contributed to this report.